An add-on for the Mozilla Firefox or for the Google Chrome. By clicking a button, you can post the contents of '#tweet-sig-in' and copy the posted URL into '#tweet-sig-out'. Alternatively, by choosing the right click menu for PC or by clicking a button for Android, you can post the contents of a selection, and copy the posted URL to the clipboard. It is supposed to be used for verification to the degree of a ready-made seal. For Firefox for Android it is convenient for citation. The currently available message service is only Twitter. For the Firefox for PC, from a page of the AMO (Mozilla Add-ons). For the Firefox for Android, from another page of the AMO (Mozilla Add-ons). For the Chrome, from a page of the Chrome Web Store. I made them in accordance with the Web Extension standard which is the standard of browser extension. The number of supported browsers should increase in the future. To what extent is an electronic signature necessary? Using a digital signature with a public key for everyday transactions is too serious and some may say that a public key can not be trusted when considering the future development of computers. Can you make it possible to verify that you are a principal with a business intention at the time of trading in a simpler way? There is a simple way to prove that a certain site is that of the person who is talking. It is a way to display the strings thought here somewhere on the site. Also, if it is known that a site is that of the person you are talking to, the third party will be able to know when the deal was in line with a signature if you publish the signature of the transaction details there. This add-on's proposal is to use a message service like Twitter as this "certain site" and to perform simple verification. In order to be able to confirm dealings after a while, you will want the site to keep data on the site. They can be deleted on Twitter. However, if the transaction violation has reached criminal level such as fraud, it seems that deleted / edited data remains on the server, so it is not impossible to restore the data. I think that blatant fraud is unlikely to happen. You will want a post to be open to everyone so that a third party can confirm it. On Twitter, anyone can protect tweets against non-followers. However, there is the idea that a third party like a notary person always publishes a post and verifies with it, and there is a method such as being asked to follow from a notary person for a fee. So I think that it is not a big problem . It is the selling point of this add-on which makes the structure simple and easy to understand after all. This add-on has two modes. In mode 1, by choosing the right-click menu (for PC) or by clicking a buton (for Android), you can post a selection, and copies the posted URL to the clipboard. 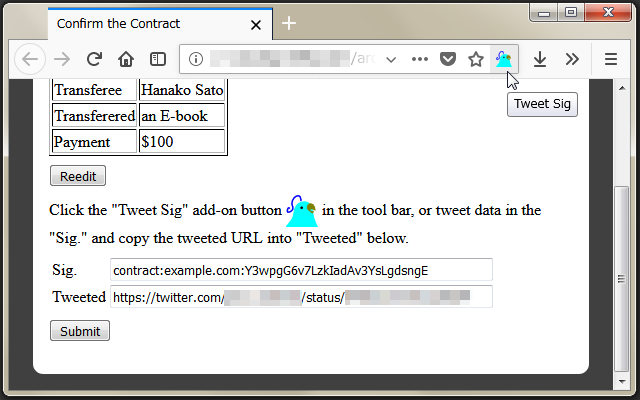 In mode 2, by clicking a button, you can post the content of the DOM element with the id 'tweet-sig-in' and assigns the posted URL to the DOM element with the id 'tweet-sig-out'. Let's explain mode 2 here. Mode 1 seems to have taken out in the middle of mode 2. Hash value of form data etc will be good as the published signature, but this add-on does not support until computing hash value. Simply assume that the hash value is contained in a DOM element whose id is 'tweet-sig-in'. If a page has a DOM element whose id is 'tweet-sig-in' and a DOM element whose id is 'tweet-sig-out', the add-on displays a button on the tool bar. When posted there, post's permanent URL is automatically assigned to the DOM element named 'tweet-sig-out'. (If the DOM element is an element of an INPUT tag, it is assigned to 'value', otherwise it is assigned to 'textContent'.) Then dispatch a 'change' event to that DOM element. In other words, the confirmation page of the form must have the DOM elements whose id are 'tweet-sig-in' and 'tweet-sig-out'. It is possible to manually let users do this work without using this add-on, but please imagine if you can easily make the explanation understood. It must be difficult. Certainly this add-on performs a special action of using the specific ids, but to explain it, it is enough to just say "install this add-on and press a button". That is the merit of this add-on. A button image is necessary when explaining to users. In such applications you can freely use (download or upload) the image of the button. The icons of various sizes are placed below. 16x16 , 32x32 , 96x96 . Let me answer some of the possible questions. A. It was easy to implement. Facebook was supported for a while, but because of some limitations, I gave up supporting. Regarding Google+, it seems that we do not have an API to post comments in the first place. According to volunteer efforts, Mastodon could be implemented in a format similar to Twitter, but it is not major and so I didn't support it. A. If you can post just by placing a button on the page, a malicious third party will be able to tweet arbitrary comments using scripts. It is normal to open another tab or window to avoid that. If you have to return the data from that tab, the level of an add-on is necessary (apart from being pre-built of the tab, such as supporting 'postMessage'). This add-on has just been made and is somewhat experimental. It is appreciated if you try to use the Tweet Sig. It was special to decide the name of the DOM element as 'tweet-sig-in' and 'tweet-sig-out', but since it was necessary to decide something anyway. What is done is very simple. Frankly speaking, the author himself has no experience of using this add-on in actual transactions. He doesn't have the opportunity to experiment this add-on. Therefore, updating this add-on is expected to be prone to stagnation. I want you to forgive me. Opinions and requests are accepted on one page of the author's blog. It is a Japanese site, but you can comment in English. Because it is an individual site, there must be many difficulties, I think. I need your tolerance. This add-on does not collect any data from users. Google and Mozilla are only making statistics about installing add-ons. This page was written in Japanese/UTF-8 and in broken English.